This speech, “Framing Christian Futuring,” was given to Bacone College at their 2007 Presidential Leadership Summit. I would like to spin a story for you about scandal, corruption, crime, and perjury–of wickedness in high places. No, I am not thinking about Bernie Madoff, Ken Lay, Bernard Ebbers, Scooter Libby, Alberto Gonzalez, or Congressman William Jefferson, the guy who was found with $10,000 in his freezer. 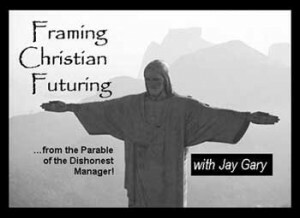 I am referring to Jesus’ shocking parable of the Dishonest Manager, the Devious Employee, or traditionally what the church has called the Unjust Steward. We find this story in Luke 16:1-8. A wealthy Galilean landowner discovers that the manager of his agricultural estate has squandered thousands of denarius. Stunned by this loss, the landowner charges his steward with corruption and asks for the books to be reconciled. The manager, fearing the loss of his job and the prospects that he may soon become a street beggar, comes up with a plan. He summons his master’s debtors one by one and reduces their bills. For the children of this age are more shrewd in dealing with their own generation than are the children of light. And I tell you, make friends for yourself by means of dishonest wealth so that when it is gone, they may welcome you into the eternal homes (Luke 16:8-9). The working poor who first heard this yarn by Jesus must have bent over with laughter. Here was a story of one of Herod’s wealthy friends, who had grown rich through confiscating peasant lands. He was as well connected to the White House as any Halliburton board member might be today. In one swell swoop, this landowner is taken to the cleaners, not once–but twice by the devious manager. Then when it dawns on the Landowner that the joke is on him, that he has lost not only the proceeds from his harvest, but the bulk of his accounts payable–he praises the dishonest manager for the shrewd way in which he makes provisions for the future from other people’s money! Dr. Robert Duncan and the dedicated staff of Bacone College have called us to consider how our colleges, congregations and communities might make provisions for the uncertain years ahead in the early 21st century. Like Jesus’ admonition to his contemporaries, we have been charged to think God’s thoughts, to consider new trajectories, and to explore what church means in an age of ethnic polarization, rural blight, community disintegration, crumbling infrastructure and economic hardship. If there ever was a time to make provisions for the future, to turn leadership failure to community foresight, this is it. So often when we hear this parable we miss the point. We scratch our heads, and wonder why Jesus would praise a scoundrel who pilfered someone’s finances. Jesus did not praise the scoundrel for his ethics, but rather for his ability to bounce back, to think outside the box, to develop a shared solution that empowered his social network. Note that the Devious Manager did not arrive at his future through forecasting the harvest, nor through team visioning, nor through Estate planning. Instead the Manager won the lottery equivalent of his day through shrewdness–through “just in time” learning, which led to social networking and wealth of relationships. In thinking about models of Christian futuring, there may be no better exemplar of forward vision or foresight than the Dishonest Manager. Another way to say this in today’s vernacular is this: if life gives you lemons, make lemonade! With this story as backdrop, I would like to suggest three frames for Christian futuring. I define Christian futuring as leadership that encompasses the act of hindsight, insight and foresight. The backward look trusts God for what he has done. That’s called hindsight. The upward look, or insight, looks to God for what he does in us each day. The forward view, or foresight, trusts God for what he will yet do through us from next week through the next two decades, in the church, through organizations, and through society. Much of what I share you may already know. Yet when we restore an old masterpiece and put it within a new frame, this can bring fresh insight. Here are three ways in which Christian leadership today can reframe how it sees itself and its mission to heal the church and society. I trust these will help you as you practice Christian futures in your own sphere of influence. I share these three frames based on three decades of ministry, as a college pastor, a magazine editor, a world mission leader, an Evangelical author, a strategy consultant, and now an academic, in the field of global leadership with Regent University. So how can we move from failure to foresight? How can we emulate the Dishonest Manager, not in his ethics, but in how he made provisions for an uncertain tomorrow? I know for pastors, this first frame must send chills down your spine! Millennialism has caused more harm and divided more churches in the past 164 years, than practically any other aspect of theology. When I refer to the future according to Jesus, I am not talking about contemporary millennialism, Bible prophecy, Christian Zionism, or the feeding frenzy surrounding the Second Coming. If we are to see farther ahead, we must reach farther back. We must dig deeper in the wells of own tradition. We must look beneath the stones, and peer behind the text. In short, we must excavate Jesus (Crossan & Reed, 2001) and ask how he saw the future. When we think about “The Future According to Jesus,” we need to acknowledge what most overlook, the elephant in the living-room of the First-Century. This was the Roman-Jewish War, 66 to 73 C.E. (Brandon, 1968). While Jesus prophetically saw crucifixion in his own future, he also saw crucifixion, famine and captivity in his nation’s future. Looking back from the vantage of history, up to a third of the Jewish people were enslaved or crucified during the Roman-Jewish War. It was a first century holocaust, as decisive in world history as the Bubonic plague in the 1300s, or World War I to the 20th century. It marked the end of the ancient Jewish Temple state. Jews today still remember it as a catastrophe, on the Ninth of Av, usually in late Summer, as a day of mourning, to mark the destruction of the First (Babylonians, 586 B.C.E) and Second Temple (Romans, 70 C.E.). Military historians refer to this as the First Great Revolt against Rome (Faulkner, 2002). The revolt was preceded by a bloody civil war or class war among Jews. This tore their society apart and left them landless. By 135 C.E., after the Second Revolt, Jews were forbidden from residing in Jerusalem and the city was renamed. If we take the Gospels at face value, Jesus was acutely aware of this looming crisis, and counseled his generation to survive it (Luke 19:41-44; 23:27-31), as we have seen in the Parable of the Dishonest Manager. Figure 1 represents my model of Jesus’ future vision. It is really a model of how to fly when the elephant you are riding on goes underwater. I do not claim it is inspired. Nor do I suggest Jesus drew this in the sand (John 8:6)! Perhaps some of the students here, if they give themselves to historical Jesus studies, could provide a better model. 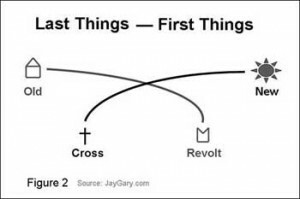 In short, I propose Jesus saw the mid-range future of the First-Century leading up the Great War as a dynamic of three paths: Conventional, Counter and Creative. The Conventional future was the mainstream future. It represented 1,500 years of Moses, or ancestral law, behind it. It had 250 years of Alexander the Great, or Greek culture, defining it. It had 100 years of Caesar, or Roman rule, enforcing it. This was the official world of “Second Temple Judaism,” ruled by the Herodians and Sadducees. In other words, the Conventional future for Jesus from the year 30 onward was the present state of Roman occupation projected into the future. The Counter future opposed this official future. This future was largely defined by the Pharisees, the loyal opposition to Jewish collaboration with the Roman Empire. The Essenes, and later the Zealots, also shaped this popular resistance to occupation. The Counter future claimed that it, rather than Herod, represented Moses. This future rallied people behind 200 years of Jewish nationalism, represented in the Maccabean revolution of 167 B.C.E. Jesus saw these two futures, Roman imperialism and Jewish nationalism, on a collision course in his generation. Left to its own, society was facing an impending collapse. Jesus weighed these two lower-line futures and found them wanting. In view of the “clash of civilizations,” of economic secularization and religious fundamentalism in his day, Jesus began to develop a third way, a Creative future that could make all things new. In contrast with a mainstream or side stream future, this Creative path was an upstream future. Jesus saw this high road transcending the lower lines. It would lead to the ideal, the kingdom of God. It would include the ancient covenant made to Israel, but raise it from a one-nation to a many-nation covenant. Jesus’ Creative future called for faith. He and his contemporaries would have to die to the old order before its external collapse. If they did, they would survive the “end of the age.” Even those who didn’t follow his lead from the outset would be given a second chance. Seen in this context, Jesus’ praise of a scoundrel makes sense. The Dishonest Manager’s world was falling out from beneath him. The same could be said for Jesus’ contemporaries. Their world was passing away, as much as Scarlet O’Hara’s ante-Bellum South was about to become history in “Gone with the Wind.” Jesus called people away from a false confidence in patronage, extreme nationalism and violence against Rome. He counseled them to make friends with their extended family by means of Mammon, so when that was gone, they might have a social network to rely upon. These were emergency ethics, as Albert Schweitzer frames it (1929). In reference to the Great War of his century, Jesus’ ministry was clearly ante-Bellum, before the catastrophe. The apostolic age led by James, Peter and Paul was Bellum, leading up and during the war. The emergence of Christianity from Judaism after the fall of Jerusalem was part of the post-Bellum reconstruction period, about which we know very little. For the past four years I have developed this model in my writing (Gary, 2004, 2006) and “Future Proof Your Ministry“workshops. Recently, I addressed the World Future Society on this subject, and have published an award winning paper on this sub-titled, “A Galilean Model of Foresight.” Note this is a Galilean model of foresight, not a model of western history, the whole of church history, nor of modern history. It helps us understand eschatology in its First-Century context. This model is contingent on its First Century context. As much as today’s end-time Christians might wish, Jesus’ prophetic awareness of the collapse of Herod’s temple cannot be transposed with certainty on any future generation. Our knowledge of the future is much more tentative. Jesus operated on the basis of divine foreknowledge. We operate with human foresight. The “Future According to Jesus” is an area for greater scholarly focus in biblical theology, contextual eschatology, and historical Jesus studies. Anglican Bishop N.T. Wright (1999) has set the agenda for research in these fields this past decade, but so much more can be done. If Jesus was a futurist, in addition to being prophet; we must ground Christian futuring in its founding events. If Jesus operated in a 200-year present, so should we. Why did Jesus praise the Dishonest Manager in the midst of his scandal? Could it be Jesus’ protagonist didn’t let his pending termination paralyze him? Instead, he saw his Last Things as a transition to First Things. That is something that Jesus could admire. When everyone around the Manager saw his world as ending, the scoundrel had faith to believe his social fortunes would rise again. We need this quality in our day, to see beyond the end, to see every ending as a new beginning in God. If Christian futuring is to recover this original sense of the Gospel, it will need to draw not only from Last Things, but also from First Things. Figure 2 is a depiction of how these two curves worked in the apostolic age. The gospel explained that the Cross was a sign that Herod’s Temple would fall, while the resurrection was a sign that Jesus’ new house, built without hands, was rising. Both those who believed and those who didn’t would know that God had instituted a New Covenant when the Old was taken away (Hebrews 10:9). Last Things, or Eschatology, is derived from the Greek word eschaton, meaning the study of the End or last days. Eschatology is that branch of systematic theology that focuses on last things, such as heaven, hell, immortality, resurrection, the last judgment, and the coming of Christ. Fundamentalists commonly think this field is referring to the end of the world, the end of space time history. Twentieth century scholarship (Hoekema, 1979, McKnight, 1999), however, has amply shown that Jesus was more likely talking about the end of an age, or “aeon“–or the end of the Second Temple period (Fletcher-Louis, 1997). Paul likewise felt the present age of Law was passing away (Pate, 1995), to be subsumed by an age of Grace. Instead of just building on Eschatology as the end of the Old Covenant, Archonology could focus on the beginning of the New Covenant and its developmental dynamics in history. Archonics could be considered the architecture of the possible. God calls us by faith to give ourselves to new possibilities and to be social and spiritual architects – to shape our community’s future through originality, creativity, vision and leadership. The apostle Paul writes, “Therefore, if anyone is in Christ, he is a new creation; the old has passed away, behold, the new has come” (2 Corinthians 5:17). Early believers were called to exercise faith in the Cross, which broke their yoke to the old order, and exercise hope in the coming future, which bound them to a new order. A Last Things perspective counts down to the end of the Law. A First Things perspective counts up from the beginning of Grace. Eschatology deals with the end of ancient Israel’s national story; Archonology deals with the beginning of the human story, as redeemed in Christ. This realization that we should count up from Christ–rather than count down from the Creation of the world, was slow for church history to grasp. Figure 3 shows how the church fathers ran through two Anno Mundi calendars before they stumbled upon our present Anno Domini calendar. The first 1,000 years of church history are marked in centuries across the top. The left column is marked from 5500 low to 6000 high. 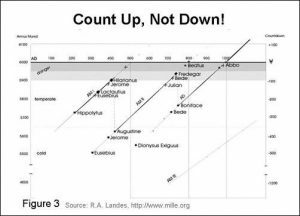 This shows the growing perception that the world would soon end, as each calendar progressed on its trajectory, whether from A.D. 100 to 400, or from A.D. 300 to 700. Dr. Richard Landes (1988) shows how the two Anno Mundi calendars fell into disuse once they entered the “danger” zone of 100 years in the countdown to 6000. It was not until Bede, the English historian, adopted Dionysus Exiguus’ Anno Domini calendar, that society could put the non-canonical World Sabbath Week legend to rest. Christian futuring, as a practice among church leadership, could bring real balance to the people of God with a focus on First Things. I like how Reggie McNeal (2003) captures this sense of possibility when he calls us to be a Present-Future church, rather than a Present-Past church. We need to view our loved ones, our co-workers and our congregations in this same sense–that their future is open-ended. Short of the return of Christ, it is not a stretch to envision that people of faith living 10,000 years from now will see us as the early church. We need to embrace the First Things of the New Covenant, rather than just languish until the End of Days. Note that in Luke 16:8 Jesus claims “the children of this age are more shrewd in dealing with their own generation than are the children of light.” Apparently, then, like now, the merchants of Jesus’ day were cannier to seize opportunity than the people of God. It is no accident that the social entrepreneurs of our age are not asking for advice from the church on how to build the cities of tomorrow. This is not the first time that the church found itself as “yesterday’s children”? What can we do, as Donovan (2004) asks, to re-found the church at the dawn of the Third Millennium? I suggest as we turn to Christian futuring for help, to frame our quest broader than just Church futures to encompass missional futures. I was slow to heed Dr. Barrett’s counsel, but finally when I realized that Evangelicals were so focused on 2000 as a managerial target, to the neglect of preparing churches for a new century, I began to immerse myself in the world of professional futures. Each July since 1996 I have spoken to the annual conference of the World Future Society, usually attended by a mix of some 1,000 leaders, whether business people, consultants, educators or non-profit executives. In 2002, I became a founding member of a smaller society, the Association of Professional Futurists. While there are some exceptions, I found that most futurists are not opposed to values and faith perspectives. They are not exclusively secularists. They care deeply for the future of religion and society. But their vocations seldom intersect with the church. Why has the church become so irrelevant to the world? One reason is that over the centuries, two words in Latin developed for time. One phrase governed the human realm, futurum; the other governed the divine sphere;adventus (Peters, 2005). Futurum refers to the natural future that arises from the present. The futurum of an acorn is an oak tree. The futurum of a child is an adult. Adventus refers to the divine future that is ahead of us, that breaks into the present. Adventus broke into the present when 70 years of Soviet militarism collapsed and ended the Cold War. Normally, however, Adventus is confined to the liturgical calendar, with the feast of Christmas drawing our attention to the first and second coming of Christ. Although there are exceptions (Moltmann, 1963), sacred theology did not grow in imagination, investigation, and forward engagement, nearly as much as the natural and human sciences which studied God’s creation (Kung, 1988). This is despite that fact that in the 20th century, the kingdom of God came to be recognized as both present and future, as “already, but not yet” (Schwarz, 2000), or encompassing both futurum and adventus. These twolanguages of futures studies and theological studies may first appear to be at odds, but they can grow together. The practice of Christian futuring could be that touchstone between these two disciplines if it focuses on missional, not just church futures. I would like to challenge you to make Christian futuring an all encompassing practice for both clergy and lay. While it should focus on church futures through methods such as Natural Church Development (Schwarz, 1996) or Percept surveys, it should focus on much more. Christian futuring should become an applied theology of hope (Gary, 2004). It should be practiced on Sunday through worship, but also from Monday to Saturday through faith, hope and love. It must become missional. Or as Kester Brewin (2007) says, we must have a vision for a church that is organic/networked/decentralized/bottom- up/communal/flexible/always evolving. This will involve an upgrade, both internally in how we think, and externally in how we interface with life (Vincent, 2007), to Christianity 2.0. Christian futuring should not become just another version of planning-directed church growth (Easum & Cornelius, 2006; Malphurs, 2005), as helpful as that may be. Instead, it should become a personal and group practice of double-loop learning (Argyris & Schon, 1977), encompassing hindsight, foresight and insight. Another way to talk about missional futures, rather than just church futures, is to help people cultivate foresight. We live in a day when the church must help people develop vocations related to redeeming and leading emerging fields in the coming Molecular age (Meyer & Davis, 2003). This could be agricultural genetics, material engineering, astronomical sciences, artificial intelligence, environmental management, governance, health or gerontology. My working definition of foresight follows the lead of Dr. Richard Slaughter. He sees foresight as an internal capacity of leadership, much like creativity or vision. He defines foresight as “the ability to create and maintain a high quality, coherent, and functional forward view and to use the insights arising in organizationally useful ways…” (1998, p. 382). Useful ways in a faith context might mean to illuminate emerging issues in ethics, reinvent aging institutions, leverage outreach through strategic alliances, reach new generations, or act proactively in light of demographic changes. One of the critical tasks to ensure that Christian futuring is properly framed, learned and practiced is to see it become embedded in the academy. In this regard, for several years I have followed the work of Dr. Leonard Sweet and Dr. Robert Duncan through Drew Theological School. Four years ago I took my own plunge into academics to help Regent University, in Virginia Beach. Together with the Dean of the School of Global Leadership & Entrepreneurship, I began to help their 500 MBA, M.A., Doctorate and PhD students grapple with the field of Christian futuring, from the framework of strategic and social foresight. After much labor we launched a separate M.A. 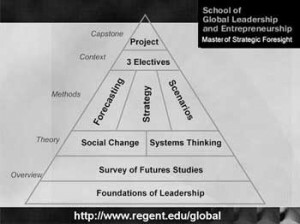 in Strategic Foresight, with introductory, theory, methods and elective courses. Futuring also has become the first course of our entrepreneurial MBA, an elective concentration with our Masters of Organizational Leadership, a third year option within the Doctor of Strategic Leadership, and research options within our PhD in Organizational Leadership. Both these examples illustrate how our teaching ministries, whether in graduate schools, colleges or denominations, need to encompass this field and help people from all walks of life grapple with change, innovation and creativity. We must focus on missional, not just church futures. The parable of the Dishonest Manager challenges us to view our failures not as the end, but as new beginnings. We should not be dismayed by leadership scandals, natural disasters, broken government, financial meltdowns, or even personal tragedy, because God is all and in all. The calling for our time is to move from leadership failure to foresight. The future according to Jesus shows us the creative path. The realm of first things lets us explore the divine limits of human possibility. The call to be missional, rather than provincial, challenges us to be engaged in all walks of life. Let us avoid the ethics of the Dishonest Manager, but let us emulate how he responded to disaster. Let us approach the future with faith to make all things new. Dr. Jay Gary is president of PeakFutures.com, a foresight consulting group. Over the past twenty years Jay has helped non-profits, foundations, civic leaders, and strategic alliances to create more promise filled futures. He also teaches strategic foresight, innovation and leadership at the graduate level and through professional development courses. 1. What is the message of the Parable of the Dishonest Manager? Why does Gary suggest that Jesus’ anti-hero might be a fitting biblical example for our time? 2. What was the catastrophe of the First-Century? How does the “future according to Jesus” help you understand Jesus’ world? Our world? 3. Why is End-Time Christianity limited? How can Christian futuring move beyond it’s blind-spots? 4. How does our language of time limit us? How does Gary think futures studies can help the church move beyond just strategic planning? Argyris, C., & Schon, D. A. (1977, Sept – Oct). Double-loop learning in organizations. Harvard Business Review, 55(5), 115-125. Barrett, D. B., Kurian, G. T., & Johnson, T. M. (2001). World Christian encyclopedia: A comparative survey of churches and religions in the modern world (2nd ed.). New York: Oxford University Press. Brandon, S. G. F. (1968). The fall of Jerusalem and the Christian church: A study of the effects of the Jewish overthrow of A. D. 70 on Christianity. (2nd ed.). London: S.P.C.K. Brewin, K. (2007). Signs of emergence: A vision for church that is organic/networked/decentralized/bottom- up/communal/flexible/always evolving. Grand Rapids, MI: Baker. Crossan, J. D., & Reed, J. L. (2001). Excavating Jesus: Beneath the stones, behind the texts. San Francisco: HarperSanFrancisco. Donovan, V. J. (2004, e-book). The church in the midst of creation. Colorado Springs, CO: Bimillennial Press. Easum, W. M., & Cornelius, B. (2006). Go big: Lead your church to explosive growth. Nashville: Abingdon. Faulkner, N. (2002). Apocalypse: The great Jewish revolt against Rome, AD 66 – 73. Charleston, SC: Tempus Publishing Ltd.
Fletcher-Louis, C. H. T. (1997). The destruction of the temple & the relativization of the Old Covenant: Mark 13:31 & Matthew 5:18. In K. E. Brower & M. W. Elliott (Eds. ), Eschatology in Bible & theology: Evangelical essays at the dawn of a new millennium (pp. 145-170). Downers Grove, IL: InterVarsity. Gary, J. E. (2004, Spring). Creating the future of faith: Foresighted pastors and organic theologians. Dialog: A Journal of Theology, 43(1), 36-40. Gary, J. (2004, 24 May). The future according to Jesus. Gary, J. E. (2006). The future of business as mission: An inquiry into macro-strategy. In T. Steffen & M. Barrett (Eds. ), Business as mission: From impoverishment to empowered (pp. 253-273). Pasadena, CA: William Carey Library. Gary, J. (2008, September). 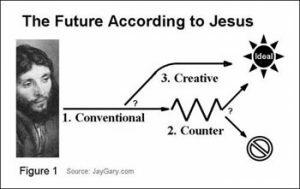 The future according to Jesus: A Galilean model of foresight. Futures, 40(7), 630-642. Hoekema, A. A. (1979). The Bible and the future. Grand Rapids, MI: Eerdmans. Landes, R. A. (1988). Lest the millennium be fulfilled: Apocalyptic expectations and the pattern of western chronography, 100-800 C.E. In W. D. F. Verbeke, D. Verhelst & A. Welkenhysen (Eds. ), Medievalia Lovaniensia, ser. 1(pp. 137-211). Louvain: Studia XV. Kung, H. (1988). Theology for the third millennium: An ecumenical view. New York: Doubleday. Malphurs, A. (2005). Advanced strategic planning: A new model for church and ministry leaders (2nd ed.). Grand Rapids, MI: Baker Books. Meyer, C., & Davis, S. M. (2003). It’s alive: The coming convergence of information, biology, and business. New York: Crown Business. McNeal, R. (2003). The present future: Six tough questions for the church. San Francisco, CA: Jossey-Bass. McKnight, S. (1999). A new vision for Israel: The teachings of Jesus in national context. Grand Rapids, MI: W.B. Eerdmans. Pate, C. M. (1995). The end of the age has come: The theology of Paul. Grand Rapids , MI: Zondervan. Peters, T. (2005, e-book). Futures, human and divine. Colorado Springs, CO: Bimillennial. Schwarz, C. A. (1996). Natural church development: A guide to eight essential qualities of healthy churches. Carol Stream, IL: ChurchSmart Resources. Schwarz, H. (2000). Eschatology. Grand Rapids, MI: W.B. Eerdmans. Schweitzer, A. (1929). Civilization and ethics (C. T. Campion, Trans.). London: A. & C. Black. Sherden, W. A. (1998). The fortune sellers: The big business of buying and selling predictions. New York: John Wiley. Slaughter, R. A. (1998, November – December). Futures studies as an intellectual and applied discipline. American Behavioral Scientist, 42(3), 372-386. Templeton, C. B. (1996). Farewell to God: My reasons for rejecting the Christian faith. Toronto, ON: McClelland & Stewart. Vincent, R. J. (2007, e-book). Integral Christianity. Colorado Springs, CO: Bimillennial. Wright, N. T. (1999). The challenge of Jesus. Downers Grove, IL: InterVarsity.